When I was a college student, one of the meals I consistently ate was ramen noodles. I could often pick up twelve packages of it for $1. I would take it home, boil it up, add the seasoning packet, and enjoy. Over time, my taste buds became a bit more discerning – and I became a bit more health conscious, too. I began to realize how unhealthy the seasoning packets were, full of sodium and MSG and other things I’d rather not think about. Still, the price was alluring. I could often find packages of ramen on sale for $0.10. I’d still eat them for lunch on occasion. 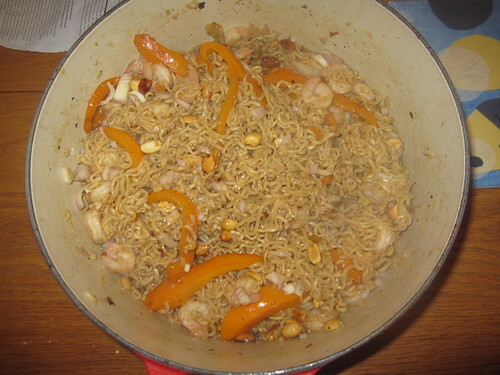 Eventually, though, I started experimenting with the noodles. What can be done with them that’s flavorful and interesting? I tried using them as ingredients in other dishes without the seasoning packet, eventually to much success. 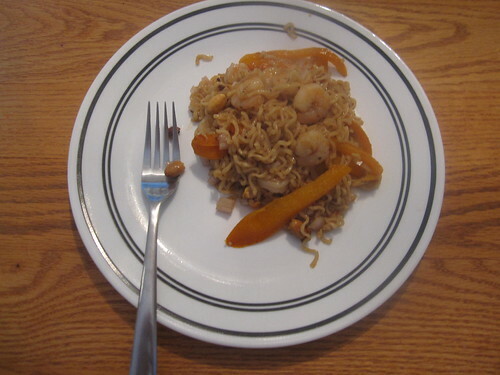 I eventually reached a point where I found great success making skillet meals out of Americanized versions of Eastern cuisine – kung pao shrimp, for example. By cooking these meals in a skillet and adding ramen, I had a simple and low-cost way to make a very hearty and flavorful family meal. Note: I’m using shrimp in this example. While I’m on a mostly vegan diet, my diet does include a weekly dose of either fish or seafood in order to get some omega-3 fatty acids into my body, so this is how I got it in this week. This recipe is similar to the “Kung Pao Style Shrimp with Ramen” recipe found in The Best 30-Minute Recipe. The total cost of ingredients for us was about $11, but it made enough for nine meals, dropping the cost per meal down to nearly $1. Note how this recipe again uses our simple homemade stock recipe. This stuff is so easy to make and contributes flavor to everything. The biggest thing you can do in advance is to cut up the bell pepper and the scallions. You can also mince the garlic and grate the ginger if you wish, but these are perhaps best if you do them right before adding them to the dish. You’ll have time to do this while cooking. You can easily prepare this meal in a large pot. I used a 5.5 quart enameled cast iron pot to cook this entire meal without any difficulty. 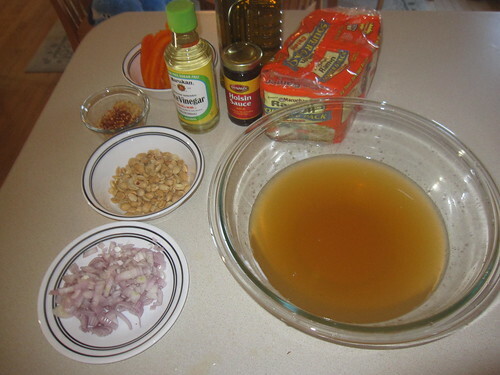 To start, add a teaspoon of the oil to the pot and heat it over high heat until the oil seems to shimmer. Add half the shrimp, let it cook for about a minute, then toss the shrimp. Let it cook for about a minute and a half more, then remove all the shrimp to a separate bowl. Repeat this entire procedure, oil and all, with the other half of the shrimp. Drop the heat down to medium-high, then add the remaining oil. When it’s shimmering, add the sliced peppers and peanuts. Cook these while tossing them for about three minutes or until the peppers are fairly soft, then remove the peanuts and peppers to the bowl with the shrimp. Add the garlic, ginger, and red pepper flakes and stir them continuously for about thirty seconds (your kitchen will begin to smell tremendous at this point). Slowly add the stock, then start adding the ramen noodles. 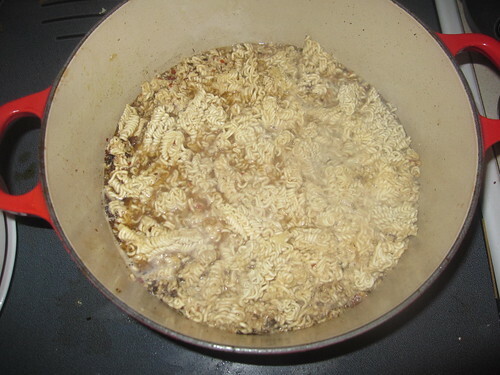 Break the ramen noodle bricks up as you add them to the liquid. 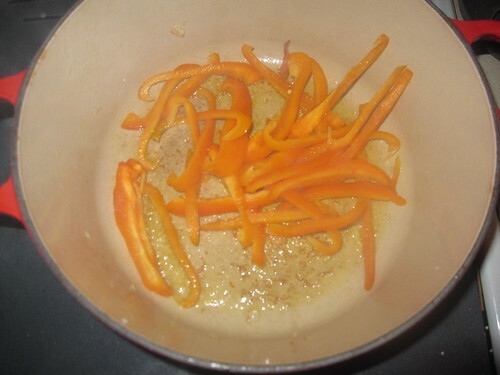 Bring this mixture up to a simmer, then stir this entire mixture with tongs for about two and a half minutes. You should be slowly breaking the pieces of ramen apart into distinct noodles with the tongs. Add the remaining ingredients (hoisin sauce, rice vinegar, optional sesame oil, and scallions) and let it continue to simmer for about a minute and a half more, then serve. My family loved this stuff. All of the leftovers were happily consumed. The biggest change you might make is that you could substitute all sorts of things for the protein in this meal. Chicken works, as would beef or even tofu. I would suggest pre-cooking the chicken or beef in a separate container, then adding water to the hot pan once you’ve removed the meat. Save that water, as it’ll make a great liquid to use in this recipe. Depending on the flavor you’re seeking (and what you have on hand), you could also easily substitute soy sauce for the hoisin sauce.